leadership necessary to deliver quality programs to our council membership. our council and the community at large. council’s leadership resource committee in building strong and functioning district committees. Objective: Increase Scouting awareness and participation, including volunteer and staff leadership, but most importantly youth participation, in southern Bexar County. Then, increase the number of Cub Scouts that cross into Boy Scouting, with the ultimate goal of increasing the number of young men attaining the rank of Eagle Scout. and achieve our membership goals. – Increase traditional membership at a higher percentage than other areas of Alamo Area Council. covering southern Bexar County to achieve the objectives of Project Aguila. Objective: Increase the visibility and positive image of the Alamo Area Council by enabling the achievement of our long range plan. – Develop a total marketing plan to showcase Scouting. Scouting and improve recruiting results. – Increase communications to youth and families through internet and social media. – Promote all council activities through electronic and digital means. Objective: Provide the highest quality programs to address the needs of the Scouting community as measured by unit and Scout participation and advancement using the latest technology available. McGimsey Scout Park and the Mays Family Scout Ranch. 2013 through increased accessibility to district training teams. – Increase use of technology to track training and program participation. Objective: Grow and sustain, during the next three years, the financial resources needed to achieve the goals set forth in this strategic plan while allowing us to plan for the future. – Achieve growth of 5% in Friends of Scouting contributions in each of the next three years. – Add an average of $1 million to the Council Endowment Fund in each of the next three years. – Secure and/or disclose commitments of 25 planned gifts to the Council Endowment Fund in each of the next three years. 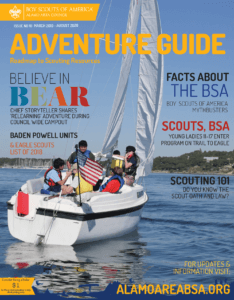 Objective: Strive to exceed the BSA’s benchmark of 2% annual traditional membership growth, and continue growth in Learning for Life participation, increasing year-end registered youth membership to 30,000 by December 31, 2014. – Develop a membership plan to serve 28,650 total youth by end of the year 2012 and 30,000 by year end 2014, of which traditional programs will serve 19,000 youth and Learning for Life 11,000. – Increase the number of Scouting units by 5 each year. As always, it is an honor to be able to make this Strategic Plan available, and we look forward to next year when we can inform you of the many ways we continue to change the lives of the youth in the Alamo Area Council.